Prius in the Snow Is a No-Go? Here in New York this year, we've gotten no greater quantity of snow on the ground than during an average Grand Funk Railroad tour circa 1975. That means we've got no first-hand knowledge of the Toyota Prius's handling in the white stuff. But some owners are reporting that slick roads are causing funkiness within Toyota's Hybrid Synergy Drive system. In several cases noted on site ConsumerAffairs, the cars' electric power goes down as soon as the tires detect any loss of traction, sort of like a child learning to ice skate. At issue is the way the car's TRAC traction control reduces power or cuts it altogether. 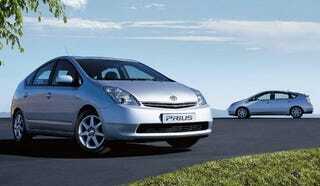 Any Prius owners here tonight? Let's get this problem snorted sorted out.